NEW OWNERS - Erin and Michael Emmerson are the new owners of the Parkview Family Restaurant and Inn, assuming ownership of the business June 1st, 2013. With the couple in the restaurant dining room are their children Kayla (left) and Leslie (right). 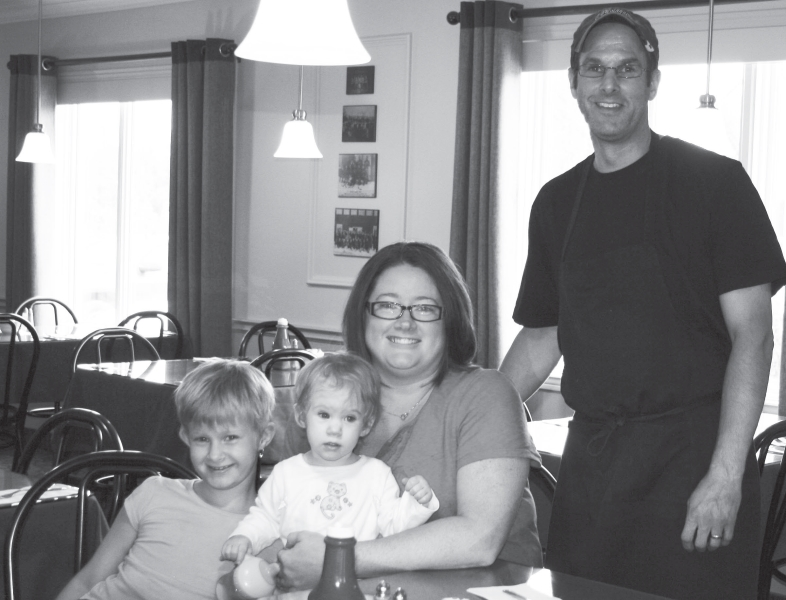 The Parkview Family Restaurant and Inn is under new ownership. The popular eating establishment was taken over by Erin and Michael Emmerson, effective June 1st, 2013. The business, formerly known as the Big B, was bought 19 years ago by the late Don Macdonald. His son Shaun assumed its ownership following his father’s death several years ago. The Emmersons are not new to the food service industry. Michael, a graduate of the Community College culinary program, has been working in the restaurant business for 15 years. Erin is well known for her meal catering skills. She says they have been talking about owning their own business for several years but nothing suitable appealed to them. Erin worked in her family’s oil business, D.W. Thompson Fuels Ltd., and when it was bought out recently, it created the opportunity for the couple to say now is the time to be on their own. When they heard the Parkview might be available to buy they inquired and, now they’re the new owners. “It’s a bit overwhelming,” said Erin. Not much will change in what is available on the menu or how the restaurant and motel operate right now. They do have plans for both but that’s down the road. Both say there are things that make the Parkview, the Parkview and those will never change. They’ll add their own touches, such as catering, as the business progress and grows. They do plan to offer daily specials, meals that aren’t on the menu. Those will be advertised so patrons will know what is available each day. Homemade is the operative word in everything. “We want it to taste like home, for people to have the memory of what their mom or grandmother made,” said Michael. Erin agrees saying the restaurant now provides the base. They just want to tweak it here and there. “We do have things in mind but we’ll do them as we go, not all at once,” said Erin. “We’ll make it work for us.” She says it’s great to be in a business back in her own community.